About 15 years ago, when my husband and I bought a Victorian rowhouse in Washington, D.C., the "landscaping" consisted of a few scattered weeds. Not long after moving in, we began clearing and planting the tiny yard. There was room for only one tree, and we selected a Bradford pear. It turned out to be a terrible choice. "Many people make this mistake," says D.C. landscape architect Mary Pat Rowan. 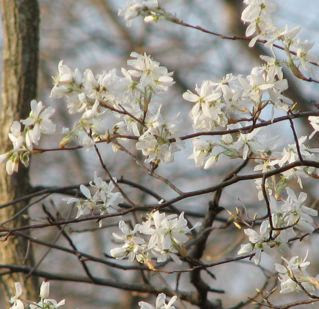 "A serviceberry would have been better." These small native trees, also called juneberry or shadblow, entice more than two dozen species of birds to their fruit. Their beautiful spring foliage is equal to that of the Bradford pear, and their fall foliage is superior. Read the rest of the article at the NWF website.